Yesterday I said I'd be back, but our walk on the beach turned into an event and the day just disappeared before I knew it. They were carrying him out of this. They laid him out on the sand and the paramedics began CPR on him. All of this was caused by this group of people. 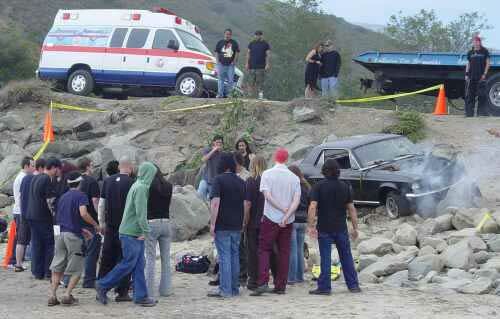 OK, as you can see they were doing a movie shoot at the beach. That was a prop car and actors. Well the victim is a rock singer for the group COLD. This was a shoot for a music video that will be on MTV. 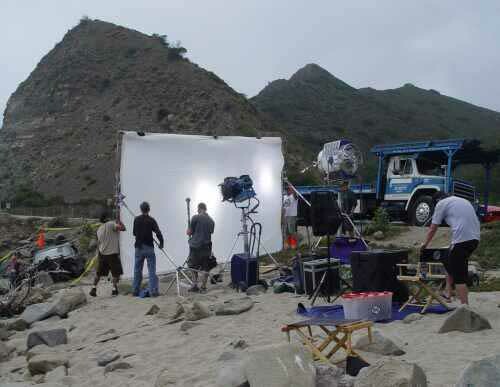 The first day we were day camped by the ocean there was filming going on just above us. Later that day a helicopter was flying back and forth. We figured the chopper was filming a scene for whatever the movie people were doing. Camping is great. As I am typing this, I look out my window dinette window and there is a small cotton tail rabbit just outside. We see quite a few rabbits and squirrels here. A while back I saw some epoxy putty and bought a container of it. I had never tried it until yesterday when I was doing some repair around the motorhome. This stuff is like clay or putty. It comes in a 3/4 inch across roll and you cut off a slice. It has two parts. You knead it until it is blended. I just used my fingers like it was clay. Then I put it on a running light fixture. The plastic holding the bulb in was broken. I could roll it and make strips to lay across the area and then push more on the ends. I like this stuff. It is called, "Handi-Weld", but may be sold under other brands also. Handi-Weld hardens in about 20 minutes. It does not run. Like I said, it is like clay and easily formed and molded to the place you are repairing.